Talking Travel’s mandate is to transform travel professionals into destination masters through skill development that translates into revenue generation. 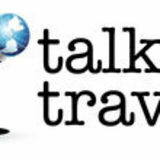 Specializing in Conference Keynotes, Destination Master Classes, Destination Presentations and Training, Niche Markets and Lifestyle Programs, Agency and Company Coaching, Program Development and Travel Writing, and all in the service of revenue generation Contact info@talkingtravel.ca to discuss your training needs. In the time of Confucius, the very concept of having "10,000' of anything was equivalent to today's concepts of quadrillion dollar national budgets and computer terabytes and petabytes. It was an unfathomable idea in 550 BCE but as soon as people started to travel and the world around them became a smaller place, the idea of '10,000 miles' became yesterday's news. Today’s travellers are looking for the ‘what else’ in travel. They translate the word ‘value’ to mean something that will satisfy their need to do something extraordinary on their vacation and ultimately to exceed their expectations. Of course the idea of ‘extraordinary’ is in the eye of the beholder. I love that expression because it covers so many aspects of what I believe travel to be all about: Research and then embark on your travels. A beach holiday at a three-star all- inclusive can be extraordinary if it responds to a need for fun and relaxation and convenience and cost. And an adventure in Peru or Tibet or Japan can also be extraordinary if the experience matches and surpasses the customer’s dreams of interacting with the people and the culture, engaging in some physical challenges, gazing at magnificent landscapes or ancient temples and monasteries, enjoying the food and local drinks, and adopting the attitude of ‘global tourist…out to explore as much of the world as possible’. The research can take any comfort form you wish, whether it is through social media, Google, public forums on travel advice, seminars, webinars, travel literature, guide books, magazines, newsletters, television, movies and more. 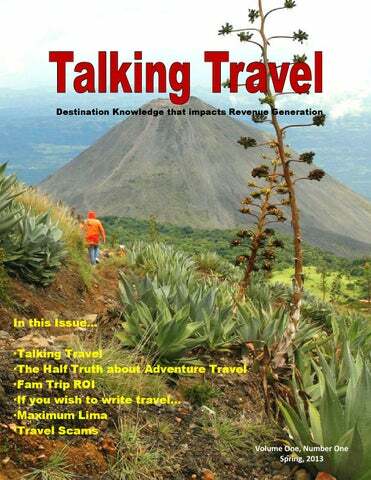 Talking Travel, The Magazine will feature destinations, travel skills, travel trends, photography, niche markets, lifestyles and even some travel humour. You know, I think this is the beginning of a beautiful friendship. A friend of mine discovered a wonderful saying attributed to Confucius, the Chinese teacher and philosopher who lived around 500 BCE. "Read 10,000 Books...Travel 10,000 Miles". Once you have done your research then travel is more meaningful and relevant, no matter what your motivation may be. Today's travellers seek experiences ranging from pure and total leisure to absolute adventure, and everything in between. They want to exercise their passion for activities that are meaningful to themselves and not necessarily restricted to a generalized packaged tour. Culinary, Luxury, Adventure, Culture, Sustainability, Giving Back...these are some of the themes that resonate on a cross-generational basis with people who love to travel. a memory of an excursion’, to being a truly meaningful partnership with people and the environment. Whether the journey is to Kathmandu or Kitimat, Montreal or Machu Picchu, Truro or Tibet, there is so much more you can get out of travel. 1) Take a photo—and when your local subject asks for a copy in the mail, actually do it! This may be the only photo they have of themselves. promoting your travel-ability. Your smile will inevitably be returned 4) Leave a T-shirt or postcard of your home town, province or country 5) Give a toy to a child. I give out finger puppets. A friend gives out Zorro masks— another, bubbles. Don't give toys with small pieces that can, if swallowed, cause a child to choke. Don’t give out coins or candy as it encourages begging and contributes to dental problems. Treat a kid, like a kid and it's ok to be a kid yourself, no matter what your age or status in life. 6) Exchange a song. When in Mongolia, sometimes you are only allowed to enter a Yurt until after you have sung a song. Row, Row, Row Your Boat, sung in rounds, is a popular selection, as is Frère Jacques, the Inky-Dinky Spider, Do Wah Diddy and even O Canada! a donation when visiting cultural sites: temples, artist studios, Help the locals to maintain the that you have just enjoyed. 10) Bargain in good faith. The 50 cents you save may give you pride because you “beat down” the salesperson, but you may have also robbed that person of extra food or prevented his or her children from purchasing school books or a mandatory school uniform..
YOU were there to experience this one event in your own unique way. 1) Excitement, enthusiasm and a sense of wonderment by visiting a new destination. 8) Another country. For those countrycounters out there, you know that every country has its own unique characteristics. It is not just another number… or another country on a particular continent. It is not a faceless destination but it is actually someone’s home. Travel is a declaration against generalizing and stereotyping and should always be a celebration of the diversity of the planet. 9) What you take with you is a feeling that even if it is your first-ever country visited, you have made a positive advance toward being a global citizen. 10) What you take with you? A sense that while our planet may be lonely in the context of being the only one that supports life (that we know of) in our galaxy, the planet is anything but, a sad, disconsolate place. It is a thriving, boisterous cacophony of life—and it is there for you to fulfill your dreams of discovery. For the host of a fam trip, the return on investment is measured in increased sales from the travel agents who participate. For agents themselves, the ROI of fam participation may be as simple as personal enjoyment and fulfillment. For the travel agency who sends its advisors on fams, the returns can and should be considerable – including increased revenues and improved client retention and referrals, thanks to the your agents’ insider knowledge and the excellent service they deliver as a result. Here are eight ways to get the best return on investment when your travel sellers go on a fam. 1. Set clear expectations. Provide both first-time and experienced fam trippers with what I call a “fam trip purpose and conduct manual.” This explains what the agency expects when an agent returns from a fam. For instance: educating other sellers about the destination; writing a report for the agency newsletter, social media sites, blog and/or host agency’s list-serve, and outlining a marketing plan and sales projections for the destination or product. on fams should go out of their way to engage with the locals, as this is key to understanding the ambience, feel and culture of a place. Then agents can share their impressions –– and their stories –– with clients. Sometimes these alone will sell a trip. 8. Familiarize, then incentivize. While many agencies use the promise of a fam trip to reward agents who reach a certain sales threshold, not many incentivize agents after they return from a fam. Why not reward fam trip returnees for increased sales of the destination or product they experienced firsthand? This sends staff the message that fam trips are an important business tool –– not just a travel perk. Fam trips have been undervalued for too many years. For agencies, fam trip participation should lead to improved sales and revenues, an enhanced reputation, better client retention and referrals. For individual agents, the ROI of fam trips goes beyond increased sales and includes improved confidence, client appreciation, career growth and even job security. Those travel agencies that look at fams as part of their business strategy will reap the rewards in both agent and client satisfaction. Travel Skills, Trends, Destinations, Niche Markets, Lifestyles and Revenue Generation Steve Gillick’s travel articles have appeared in the following travel industry publications over the past year. Check them out to remain on the cutting edge of industry knowledge. Epictetus, the Greek philosopher, determined that “If you wish to be a writer, write”. This was a reflection of his firm belief that people were responsible for their own actions, and therefore ‘wanting’ or ‘dreaming’ to do something could only happen if you actually did it! This does not imply that you have to be born into the role of ‘writer’. There are many avenues that lead writers to success and in every circumstance, that old adage that ‘practice makes perfect’, comes into play. matter how busy I was, I would always find time to write—usually on weekends, and many times on my home computer after a long day at the office and into the wee hours of the night. It became my way of relaxing and it still is a pleasant means of escape from reality and routine. But for me, writing is also an intellectual challenge, based on my personal credo that every word in the English language has a very specific connotation and it is the travel writer’s task to use the most meaningful words in each sentence to express thoughts, emotions, vistas and people, and try to capture the ambiance of a destination; the exuberance of an event, the titillation of one’s taste buds when partaking of unique foods, the exhilaration of seeing a global landmark that has always been on your ‘must-see’ list, and the euphoria of discovering something that you never knew existed. Travel writing topics are sometimes directly in our sight lines: If you visit Prague, then you may choose to write about Prague. Or you can look at specific aspects of the city which may be more meaningful to readers with different interests. Culinary. Our favourite lunch included grilled sausage, served with horseradish and mustard, fresh rye bread and dark beer (usually at U Glaubicu in Lesser Town); while our favourite dinner was at U Medvidku (In Old Town near the Narodni Bridge) which consisted of grilled duck, potato dumplings, sweet red cabbage and different varieties of dark beer. Likewise, when we arrived in Douz, Tunisia, we were not aware that the annual International Sahara Festival was opening on the same day. Groups from all across northern Africa were present for the camel races and the cultural competitions with costumes, singing, dancing, music and food. I was in seventh heaven—and I wrote about it! with my ipod set to randomly shuffle songs, came the mesmerizing tune “Sounds of Silence” by Simon and Garfunkle. It was like a breathe of fresh air and, after a bit of research, I wrote an article on “Silence’ as a niche market that many travellers want, appreciate and in some cases, yearn while they are stuck on a crowded beach on a package tour during the holidays. And other forms of inspiration may include the ‘serendipitous” (something that occurs by happenstance and is rewarding, or fortuitous). When our group arrived in the town of Pisac in Peru, the festival of the Virgin of Carmen was taking place. We had no knowledge of this until we arrived and found the town in a festive mood with costumes, masks, decorations and dancing. What an opportunity for writing and photographs! When our friend Epictetus wrote that “If you want to be a writer, write”, he was speaking a truism that some may say is not necessarily profound, but when you think about it, it makes perfect sense and is in itself, inspirational. Write, re-write, show your friends what you have written and have them provide suggestions. Proof-read your writing and then post it on your blog or add it to a site such as www.brouwaha.com, or send it as an addendum or comment to a newsletter article or as the article itself. Travel writing breathes fire into your experiences and allows readers to share in the spirit of your adventures. It’s an extremely satisfying activity to pursue. If you want to be a travel writer… start write now! I've been involved in the travel industry for 30 + years. And when I say "involved" I mean that aside from my 'day jobâ&#x20AC;&#x2122; I was volunteering at conferences, giving keynotes, presenting workshops and writing articles on many different topics. I wrote my own speeches and researched my own presentations. Hey, I even composed a few humorous poems on occasion! Now I'm bringing my skills for you to use! Let me make a name for yourself! Now there is no reason for you NOT to be involved. I'll write that speech to the club or social group. I'll write the article for the local newspaper or agency newsletter. And because Iâ&#x20AC;&#x2122;m ghost writing it for you...the article is YOURS to publish; the speech is written for YOU to deliver, sign your name and take all the compliments for doing such a great job. was 40,000 feet above the Pacific on a Korean Airlines flight when my shopping spree supposedly took place. The evidence that I uncovered now, twenty years later, was a photocopy of the signed ‘charge’ that VISA sent to me as part of the fraud investigation. Ahhh, one more travel scam to add to my collection which now tips the scales at about 150 different scams. head back to the bus and just at that moment, a stranger pretends to trip in your direction and spills his coffee all over you. You are shocked, upset at the dark liquid on your clean clothes and you are definitely not paying attention to the digital camera on the table or your jacket (containing your wallet), draped over your chair. The stranger is extremely apologetic and offers to get napkins to clean up your outfit. In the meantime, scam artist #2 has already disappeared with your camera and jacket. And as soon as soon as you discover this, the stranger has disappeared into the crowd too. Other forms of this scam include tripping and dumping the contents of a hotdog (mustard, relish, ketchup) on the victim. And then there is the ‘baby-bundle’ routine. In this scenario a woman has a bundle of rags that resemble a baby. She cradles the rags, rocks them and makes cooing sounds to convince everyone that there is a real baby in her arms. Then at the appropriate moment, for example, when a street car or a subway or a bus approaches, or even when the crowd is ogling at Niagara Falls, she drops the ‘baby’ over the falls or in front of the oncoming vehicle. Everyone is shocked beyond belief at what they just saw and while in their state of distractedness, scam artist #2 goes to work picking pockets, stealing wallets and even grabbing some laptops that may be abandoned for only a few seconds. But aside from distractions, travel scams can include simple but ingenious methods. There is trick that takes place on a bus, usually in a Third World country. The victim-to-be is holding their bag or backpack on their lap when the friendly stranger in the next seat suggests that the victim place the bag under the seat in order to be more comfortable. The stranger reassures the traveller by engaging them in a conversation. The victim feels at ease and finally decides to put their bag under the seat. Little do they know that the barefoot person in the seat behind has immediately begun to use their very dextrous toes to undo the clasps on the bag and is now removing some of the contents (clothing, shoes, passport, wallet etc). By the time the traveller gets off the bus, the bag is closed again and nothing is suspected. you walk away in one direction, your luggage disappears in the opposite direction. and they can pester you and try various methods to extract your cash or personal information in the years ahead. Being aware of travel scams and how they work is part of the preparation that any traveller should undergo before they set out to explore, whether it’s a package tour, a luxury cruise or independent travel. Always be vigilant, use hotel safes to store your valuables, take minimal cash with you when you are out and about, and retain a healthy scepticism when meeting new people. There are just too many scenarios where a traveller who has known a friendly local for less than 5 minutes, decides to put their total trust in the person and the results are sometimes disastrous. effect my suitcase was totally ruined, but I would resolve that another day. Time was fleeting! We made friend with the hotel concierge who gave us a few orientation tips, and then put us in a car to take us to Miraflores. While only 15 minutes away, the hotel car costs $11.00 US. A street taxi costs 6 Peruvian soles (about $2.50 US). Everyone says to be very careful when hailing a street taxi as there are some ‘bad apples’ out there, but from this point on, we always hailed our own taxi and never encountered any problems. Spotting a café by Kennedy Park in Miraflores, we had breakfast with delicious coffee (in fact the coffee is great just about everywhere in Peru) and then walked the 30 minutes toward Larcomar, the seaside shopping complex that graces the cliffs of Miraflores. Below we could see surfers, kids playing football, and even some brave souls playing in the cold Pacific waters. Larcomar has many stores that you would see at a typical mall in Canada, with a few unique craft stores and restaurants, a video arcade and some fast food. After a quick look around, we wandered back downtown. Sunday in Miraflores is quite relaxed (and very safe). There are art exhibits on the street and in the park. People are exercising in groups or doing tai-chi; walking their dogs, enjoying the flowers, attending the nearby church or chatting in the outdoor cafes. We headed over to the craft markets to browse the Inca-inspired textiles, chatchkas, masks, alpaca sweaters, ceramics, Tshirts, musical instruments and paintings. And then it was time to grab a taxi back to our hotel in San Isidro. Once there we decided to break two of our own travel rules. 1) Try not to eat at the hotel (local food at a local restaurant is preferred) and 2) Only order room service in a hunger emergency. As we had only one hour before we would leave again, we ordered ceviche (raw fish marinated in citrus juices) and a club sandwich. The ceviche was fresh and delicious, the club sandwich was one of the best I have eaten anywhere (and I’ve had a lot of clubs!). almost mystical atmosphere. This is now entered into my list of top restaurants around the world. Finally at 9:00 pm we headed back to the Westin. Quite an active day but if anything it emphasizes all the things you can do to fully immerse yourself into a city, taking in the culture, the food and the spirit of adventure on the very first day of any trip. It was our intention to maximize our time in Lima and we were now off and running! The Hagoita-Ichi (Battledore Fair) is held each December at the Asakusa Temple in Tokyo. The Battledores resemble wooden badminton racquets and are for sale, along with kites and other New Yearâ&#x20AC;&#x2122;s decorations. Popular themes include Kabuki actors, celebrities, popular athletes and anime characters. Well priced workshops, keynotes and webinars for your agency team, group, chain, conference, executive and board.